This weeks sees the introduction of a new section in the report from fellow blogmate and reviewer Lisa Hurley. She will be doing a section each week on whatever geekery or fun crosses her path in SF, fantasy, horror and all other things speculative fiction wise. This week – a Star Wars Death Star Pumpkin. 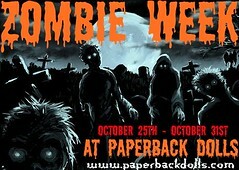 Happening this week on blog on Monday I have zombie thriller writer James Knapp here to talk about, – yes – zombies! His newest novel The Silent Army (Oct 5) is the sequel to State of Decay. I am really excited about these books which feature a very different kind of zombie. Read the blurb and I think you will be excited too. In addition to his post James will be giving away 5 books (signed), your choice of titles. On Wednesday I have returning guest Gail Z. Martin whose Chronicle of the Necromancer series I just love because of the mix of fantasy and supernatural elements. Gail’s post addresses this in her fab post as part of her Days of the Dead blog tour for her new book The Sworn, part of a new cycle in the series. Although it doesn’t release until January, Gail is excited enough to talk about it now and she has some incredible giveaways including ARCs and book packs. Behemoth Giveaway with Scott Westerfield ENDS October 25. Michelle Hauf at Vamp CHix lists some free vampire book ereads available at Amazon. Diana Rowland has the first two chapters of Secrets of the Demon (Kara Gillian #3) up on her website. Gail Z. Martin has the first chapter of The Sworn in her new cycle of Chronicles of the Necromancer series posted. Some forthcoming offerings from Angry Robot. 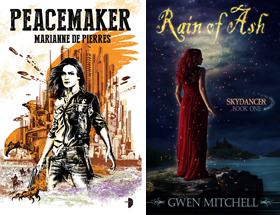 Kat Richardson was recently interviewed in a podcast by The Genre Traveller on a wide range of topics including the Greywalker series and more. Lilith Saintcrow says on her blog that the final book in the Jill Kismet series will be called Angel Town. She is currently working on an early draft. Diana Pharaoh Francis (Horngate Witches) offers up Halloween advice on 12 ways to torture your characters in this guest post. The author group blog the The Deadline Dames has had a makeover. Jeff Vandemeer presented some interior pages of his forthcoming Steampunk Bible and at it looks gorgeous. If you love steampunk this is one to put on your wishlist. Woohoo! Jess Haines reports that Deceived by Others, the third book in her H&W Investigations series is on target for a July 2011 release. Mira and Danaus get to spend a little time developing their relationship, we get some interesting insight from a character that has seen very little screen time, a new look at an old character, and are finally introduced to a character that I've been dangling about for several books. I would love to say more, but I'm waiting for this book to get the final stamp of approval. I don't want to jinx myself. Helen Lowe’s The Heir of Night Jackie Morse Kessler’s Hunger get The Big Idea treatment over at John Scalzi’s blog here and here. The League of Reluctant Adults announced three new members including Kari Stewart (A Devil in the Details), Sonya Bateman (Master of None) and Kevin Hearne (Hounded). Larissa Ione has the cover copy for the forthcoming Taken by Fire, the sixth Sydney Croft novel. Fans of the Darkyn series by Lynn Viehl will be excited to learn that she has sold a new trilogy which will begin releasing in Spring 2012. Mari Mancusi unveiled her book trailer for the upcoming YA Night School. Bellebooks say they will be releasing Third Blood, the prequel to Twice Dead, Once Bitten by Kalayna Price this winter. This week at work we were having a pumpkin carving contest. I was chosen to represent my department in that contest, because I had shown creativity before, when the nursing department needed some cardboard boxes made up all colorful and exciting-like. They warned me that once I showed a little bit of ingenuity - and dare I say artistic inclination - people would be coming to me for all sorts of creative endeavors. And so it is, and I love it. I love doing crafty sorts of things, and if I get paid for it to boot, why am I going to complain!? I mean, how often in a typical office environment do you get to roll out the colored paper and super glue and go to town? So for my pumpkin I decided it would be neat to do something Star Wars, because I'm going to be Princess Leia for Halloween. (My boyfriend is going as Han Solo and my chocolate lab is going as Chewbacca - and yes, there will be pictures.) I found this at fantasypumpkin.com. After seeing how amazing this looks, I decided this was the pumpkin to carve. So, like typical me, I waited until the night before the contest, at about 10pm, and then began the long, arduous process of carving the Death Star. My boyfriend and I worked on this thing for hours, carving and shaping and scraping the excess pumpkin flesh. I laid down to 'rest my eyes' - and promptly fell asleep at midnight. My boyfriend kept working until four in the morning, and then woke me up to observe the finished product. "Okay here's your decaf soy vanilla latte...and is that a Death Star pumpkin?" This was a lot of fun to make, and I definitely recommend trying it at least once, it's really worth the work you put into it! Jeanne Frost has a terrific contest for an ebook reader and other prizes to celebrate the October 28th release of Michael Spradlin’s, Orphan of Destiny, the third novel in his Youngest Templar series. Melissa Marr As says Harper is giving away 20 early copies of Darkest Mercy between now and Dec 16th on Goodreads. Go here to enter. For some excellent suggestions on Halloween movie selections, check out the excellent series of reviews by author Chris Marie Green. See what Meljean Brook has to say about the movie Monsters releasing next week over at Odd Shots. Fans of George R.R. Martin’s Ice and Fire series should check out the HBO Making Game of Thrones blog. This is a series I can’t wait to see. Lots of production videos there too (which I can’t see in Canada thank you very much HBO). Daenerys at left. Do we really need an Americanized version of the excellent BBC series Being Human? Check out this movie trailer for Paul, an ET spoof from the makers of Shaun of the Dead. The Bookish Type and 14 other bloggers are having a YA fantasy event called Fall Into Fantasy from now until November 30 with tons of interview reviews and giveaways. Check it out. Meljean Brook to celebrate the release of her steampunk romance The Iron Duke has been featuring a week of filled with posts and interviews with other steampunk writers. Don’t forget about the Steampunk Fortnight on Tor.com. You can find a full summary of postings to date here. Here is a truly gorgeous piece of art which will grace the cover of fantasy author Catherine M. Valente’s short story compilation called Ventriloquism. It will be out in December. The artist is Rima Staines. New covers discovered at author sites and other blogs. Click the source link to view additional information about the release. Website Discovery - The Book Cover Archive Blog and The Book Cover Archive Website. Foreign Covers: Maggie Stiefvater seems to get the most amazing covers and she has many of them considering how many languages her books have been translated in to (fifty something?). She has posted 11 new covers! Orbit Books features some new eye-catching covers a forthcoming near future thriller trilogy by Simon Morden. The year is 1881. The United States of America ends at the Mississippi River. Beyond lies the Indian nations, where the magic of powerful Medicine Men has halted the advance of the Americans east of the river. An American government desperate to expand its territory sends Thomas Alva Edison out West to the town of Tombstone, Arizona, on a mission to discover a scientific means of counteracting magic. Hired to protect this great genius, Wyatt Earp and his brothers. But there are plenty who would like to see the Earps and Edison dead. Riding to their aid are old friends Doc Holliday and Bat Masterson. Against them stand the Apache wizard Geronimo and the Clanton gang. Battle lines are drawn, and the Clanton gang, which has its own reasons for wanting Edison dead, sends for Johnny Ringo, the one man who might be Doc Holliday's equal in a gunfight. But what shows up instead is The Thing That Was Once Johnny Ringo, returned from the dead and come to Tombstone looking for a fight. Welcome to a West like you've never seen before, where "Bat Masterson" hails from the ranks of the undead, where electric lights shine down on the streets of Tombstone, while horseless stagecoaches carry passengers to and fro, and where death is no obstacle to The Thing That Was Once Johnny Ringo. Think you know the story of the O.K. Corral? Think again, as five-time Hugo winner Mike Resnick takes on his first steampunk western tale, and the West will never be the same. Tez Says has 9 new covers including American Vampire by Jennifer Armintrout. Vampire Wire has the resultssof The Ultimate Hawtest Vampire contest. Be sure to get your zombie glasses and mask at author Ben Tripp’s website. M.L.N. Hanover has an interesting article on the 100 aspects of genre fiction. Worth checking out. Josh Jasper at Genreville pints us to a great flowchart of female characters in fiction. This is hilarious but following the paths made my brain hurt. Jackie at Literary Escapism has this weeks contests, interviews and more. Also from Werewolf News, visit the Supernatural Registration Authority. Have you registered? Kelley Armstrong will be appearing November 6, 1:30 PM. John Kenneth Galbraith Library. Reading and Q&A*** YA focus **. 236 Shackleton St, Dutton, ON. Cory Doctorow on Boing Boing advised that a new Canadian SF magazine is being launched called AE named after SF writer A.E. Van Vogt. Carrie Vaughn in party-time steampunk attire. Nice Deathstar. I always love to see these! As always, thanks for mentioning the Misadventures! :) I'm glad you enjoy them. Hey Noel thanks for dropping by. Hi Doug - I am going to be all over "The Buntline Special" like white on rice. Anything that combines steampunk and the Old West is high on my list right now. I can't get enough. Looking at Lisa's Deathstar pumpkin got me thinking about my own sacrificial vessels sitting on my front stoop, and I think this year I'm going to pull out my dremel tool to carve them up. It'll either be a tremendous success for a complete disaster, but I want to try something new. Carving with a knife is so hard. Orbit always comes up with interesting ways to package their books. Those black/white optical illusion covers are interesting. I don't know if they'd sell me on the book, but I know for a fact that I'd want to pick it up and stare at it in person. Mike Resnick is a real pro at writing action and adventure with engaging characters so I expect The Buntline Special to be great fun. If you do a pumpkin, you should post a photo. ME I'm a coward with no artistic bent whatsoever. The Orbit covers a strong marketing idea but in the end I like my covers to relate to the novel in some way. Excellent weekend report Doug! Thanks for all the delicious news bits! Thank you, Noel! The tutorial on your site was so great. Would you believe my boyfriend and I pulled this one off the night before the contest? It was a small pumpkin, which is the only reason we were able to. Next year we're doing it again with a 70lbs +! As always Doug, this is simply fabulous. Thanks for the mention too! Jackie thanks and there is no way I can't link to you every week with all the great stuff you collect together.